View More In Rope Lights - Page 4. 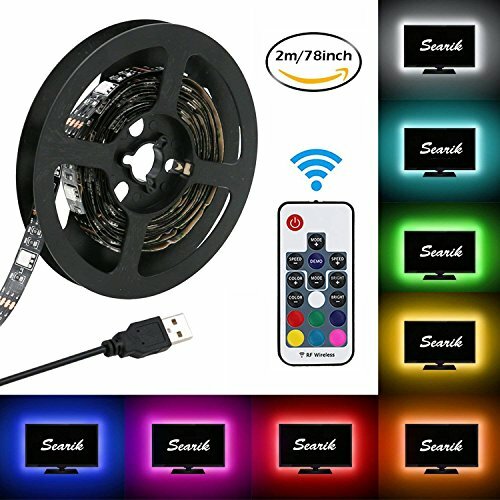 Searik USB multi-color LED strip lights kit is controlled by 17 keys rf remote controller and connected by 5V USB devices. You can connect the flexible led lamp into any devices support 5V USB ports and adjusted the color and mode as you like, which will build a comfortable atmosphere and make your life more colorful. * Can be used by any USB devices like TV, computer, desktop, laptop, tablet, car cigarette lighter, PS4, cell phone charger, 5V adapter and so on. REDUCE EYE FATIGUE & CREATE COMFORTABLE ATMOSPHERE - Adding led bias lights on TV back can reduce eyestrain caused by brightness contrast in dark. RGB TV backlighting can be also used as mood lights to create a comfortable and romantic atmosphere to fit your mood. If you have any questions about this product by Searik, contact us by completing and submitting the form below. If you are looking for a specif part number, please include it with your message.